Real Switcher. Real Graphics. Real Audio. Graphite is an all-inclusive system that combines superb big switcher performance with visually stunning 3D graphics, instant access clip servers and pristine audio clarity – all with the reliability of separate system components. 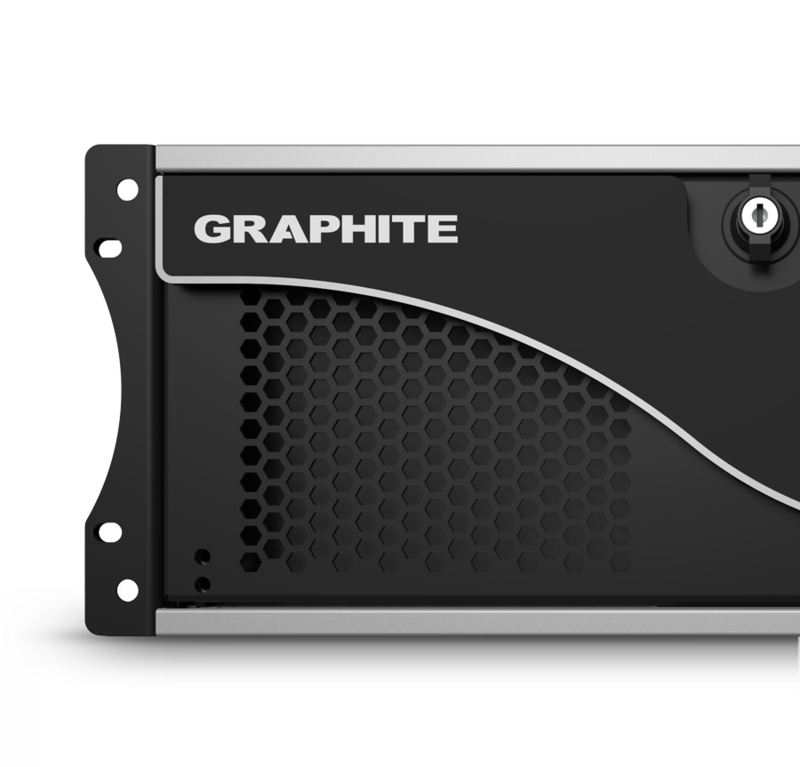 Graphite provides a full production solution within a single 4RU frame. This simplifies connectivity, saves space, and makes it easy to take top-quality productions on the road. Rely on a system with consistent performance and immunity to traditional all-in-one software issues, thanks to unique dedicated hardware. Built to withstand the rigors of a mobile production with carefully engineered physical construction. Graphite systems are extensively shake and bake tested before shipping. Every aspect of the Graphite system is built with the quality of separate system components. The value of a single all-in-one system with no need for external supplement cannot be overstated. Crew your show as you see fit. A single operator can run an entire show through all-encompassing control, or roles can be separated for multiple operators during high-intensity events. Switcher resources and graphics power can be upgraded via software licences – and additional equipment is available through a single vendor for effortless integration and guaranteed support. Graphite merges the capabilities of a Carbonite production switcher, a single channel of XPression 3D motion graphics, a two-channel clip server, and an advanced digital audio mixer. Efficiently receive and distribute audio with access to all 8 embedded channel pairs on SDI-inputs and SDI-outputs. Take a channel pair from any SDI-input and assign it to any available fader in the mixer; and configure SDI-output channels with passthrough, all mixes, Main mix, Monitor mix and custom aux mixes. A must have for microphone-heavy productions. EQ is both a powerful technical and creative tool, drawing out the best parts of your sound and removing those undesirable elements. The RAVE audio mixer’s 4-band EQ gets the best out of every channel in the mix. Maintain consistent 24-bit broadcast-quality audio with sample rate conversion on AES and SDI inputs (BNCs 1-6). Simplify audio management by configuring the Audio Follow Video (AFV) video source on a fader-by-fader basis. For example, tether various commentator lapel mics to specific camera shots in your production. More custom mixes are good custom mixes. The number of audio AUX layers has been increased from 3 to 6, allowing for more mix/minus feeds, multi-lingual feeds, and other unique output feeds. The RAVE audio mixer now supports up to 48 faders. Take loads of embedded SDI-channels into your mixer, or connect up to 3 audio modules for up to 24 analog/microphones with plenty of configurable channels to spare. Get started with fluid graphics right out of the box. Graphite ships with a complete package of easily-customized graphic templates designed by Ross Video’s creative services team – Rocket Surgery. ViewControl consolidates the control of a Graphite system onto a single intuitive touch screen interface. By leveraging the internal Carbonite’s powerful Custom Control macros and Ross DashBoard interface, every production element is visually displayed for instant touch selection. A place for online self-directed learning of the Graphite All-In-One Production System.